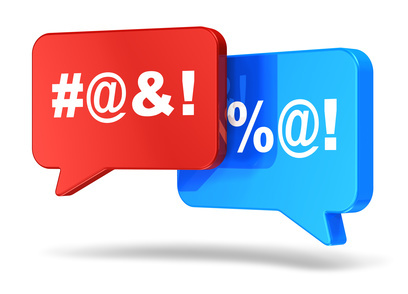 Does Calling Someone a B*tch Create a Hostile Work Environment? A female employee claims that a male co worker has repeatedly called her a stupid b*tch. Can she successfully assert a claim for hostile work environment? It depends on whether there are some other additional facts to support such a claim. A federal court in Indiana recently examined such a claim and found that it was not sufficient to support a claim of hostile work environment. Slentz v. Emmis Operating Co., Case No. 1:16-cv-02568 (S.D. In. February 5, 2018). Kristine Slentz worked for Emmis, first as a digital branch manager and then as a digital content manager for two talk radio stations. Tony Donahue and Kyle Knezevich were both producers at Emmis and so worked with Slentz on social media and digital content. Neither of them were her superiors or had any sort of say about her pay or her performance rating. About six months after Slentz had started working for Emmis, she claims that Donahue approached her and told her he read an article she had written for the Huffington Post about dating as a bisexual woman. According to Slentz, she later learned that he had shown the article to other employees and made jokes about her and her husband’s sexuality. After she complained to management, Donahue’s boss wrote him up and he was required to attend a sit-down meeting where he was told to discontinue such inappropriate behavior. A few months later, Donahue began complaining about Slentz’s work. He told other employees she was stupid and a “b*tch” (although Slentz never actually heard him say these things). Slentz spoke with someone in the HR department who conducted an investigation and determined that Donahue had not sexually harassed Slentz. Still, Donahue’s new boss met with him and reminded him of Emmis’s policies and expectations. Slentz ended up bringing claims against Emmis under Title VII, claiming that both Donahue and the other producer Knezevich had sexually harassed her and thus that she had been subjected to a hostile work environment. One of the issues before the court was whether Slentz’s allegation that Donahue frequently called her a “b*tch” or “stupid b*tch” created a hostile work environment. While the court did acknowledge that the term “b*tch” is “gender-specific and can be inferred to harbor animus in the context of a sexual harassment claim,” in this case, it was not enough. Slentz had not presented enough evidence to show that Donahue actually said those things (but had just claimed people told her he had). Additionally, after she had complained about Donahue’s statements to her about the Huffington Post article and he was disciplined accordingly, she never personally heard him say anything about the article or her sexuality again. The simple fact that Donahue had criticized her work was not actionable under Title VII. Even if Donahue was using language that he should not have been using in the workplace, it did not rise to the level of a hostile work environment. In order to have an actionable hostile work environment claim, offensive conduct has to be based on a characteristic that is protected under Title VII. Here, the court found that it wasn’t sufficiently tied to a protected characteristic. But it is worth noting that the efforts made by Emmis to respond to the complaints asserted by Slentz (by investigating the complaints and directly discussing them with the alleged offender) likely helped Emmis obtain this good result ultimately.